JET Agriculture 2019: is a state level examination organized by Maharana Pratap University of Agriculture and Technology (MUPAT), Udaipur. The government of Rajasthan founded this university on 1 November 1999. 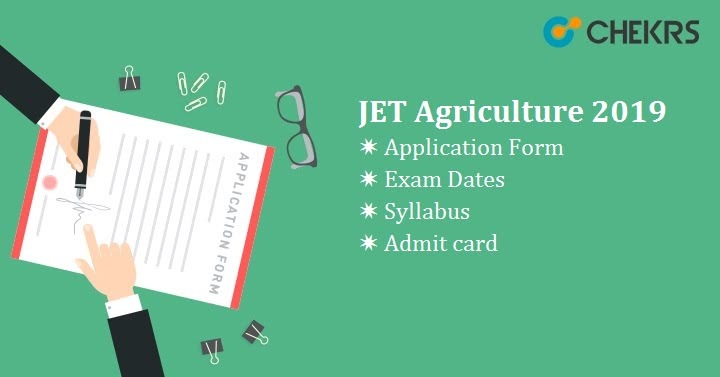 We are expecting JET Agriculture Application Form will release in the month of March 2019. This entrance exam is also called as Rajasthan JET Exam. Through this exam, candidates can get admission in Food Technology, Dairy Technology, Agriculture, Horticulture, and Forestry. Applicants can get admission in various government and private agriculture institutions of the Rajasthan state. The application form will be filled in online mode only and exam will be conducted in offline mode. Please go through this article and check the mentioned detail related to JET Agriculture 2019 Exam. JET Agriculture 2019 Exam Dates will be announced after releasing the notification by the official authority. Dates are not confirmed yet, we are providing you the tentative date on the basis of last year important dates. Keep checking this site to get updates regarding exam dates. Rajasthan JET Application Form will be available on the official website of Maharana Pratap University of Agriculture & Technology, Udaipur. The authority of Rajasthan College of Agriculture (RCA) will release JET Agriculture Application Form in the month of March 2019. Here we are providing the steps to fill the form. Visit the official portal rcaudaipur.com. Click on the Application Form link provided there. Fill all entries and upload the recent photograph along with the signature. Payment will be done by online mode only. The application fee will be Rs.2800/- (For UR/ OBC/ SBC candidates) and Rs.1400/- (For SC/ST/PC>39% candidates). The deposited fee will not be refundable/ transferable/ adjustable in any case. The candidate must have studied for the last three years in the qualifying examination as a regular student in the recognized institution of Rajasthan. Parents of the candidate must reside in Rajasthan for a period of last 10 years and candidate has studied for at least 5 years during this period from any recognized institution of Rajasthan state. The candidate must be a bonafide resident of Rajasthan. He/ She may be presently studying in any of the states other than Rajasthan. Children of a Judge of Rajasthan High Court subject to that he/she submit an undertaking/affidavit stating that such benefit is not claimed or availed by them in any other State. Son/Daughter of serving or retired employee of Paramilitary Forces of India retired or permanent employee of Indian Defense Service of Rajasthan origin must be posted in Rajasthan at the time of the last date of the application for admission. (b) Any of the Universities in Rajasthan or Board of Secondary Education, Rajasthan provided that the employee has worked in Rajasthan for three years preceding duly constituted by the Government of Rajasthan by an act of Law the last date of submission of the application. Student must have passed 10+2 from any recognized board, Ajmer board/university or Rajasthan board with agriculture, biology, chemistry, physics and mathematics subjects i.e. PCM, PCMB, PCB, PCA, Ag. Stream etc. Arts and Commerce are not eligible. Student must have passed with minimum 50% marks in 10+2/equivalent exam (For SC/ST/OBC-NCL/SBC-NCL, it will be 45%). The maximum age limit is 25 years as on 01-01-2019. The candidates taking the advantage of 5% relaxation will not be considered in UR category. Candidates having supplementary in 10+2 recent examination will not be considered for the exam. Check the Exam Pattern of Rajasthan JET before appearing for the exam. It will help you to know the difficulty level of the question, total marks, time duration, marking schemes, subjects etc. The Question paper will be available in the following five (5) subjects namely, Agriculture, Biology, Chemistry, Mathematics, and Physics, however, the candidate has to attempt three subjects. Candidates seeking admission in Agriculture/ Horticulture/ Forestry/ Fisheries/ Food and Dietetics may attempt any three subjects. The Paper will be in English and Hindi both languages. It will be of objective types. If more than one option is chosen, it will be treated as the wrong answer. No marks will be deducted for the unattempted question. The Syllabus of JET Agriculture will be comprised of subjects like Mathematics, Physics, Chemistry, Biology and Agriculture of class 11th & 12th. For more detailed Rajasthan JET Syllabus, you can visit the portal of Maharana Pratap University of Agriculture and Technology, Udaipur. The authority of Maharana Pratap University of Agriculture & Technology, Udaipur will release the JET Agriculture Admit Card 2019 probably in 3rd week of May. Candidate can access their admit card from the official website. The Rajasthan JET Admission Card will not be sent to any candidate by post or any other mode. It is mandatory to carry admit card while appearing for the examination. Visit the given URL rcaudaipur.com. Enter the required details to download the JET agriculture Hall Ticket. It will redirect to the next page, where admit card will appear in PDF format. Save it and take the print out of it for future reference. The Answer key of JET Agriculture will be released within 4 or 5 days after conducting the exam successfully via online. Applicants can match their answer with the answer key. Candidate can file the objection to the provided answer key if they are sure about the correct answer. Submit the objection on or before the last date of submission, after that it will not be accepted. JET Agriculture Result will be declared in the month of June 2019 on the official portal by the authority of Maharana Pratap University of Agriculture & Technology, Udaipur. The Rajasthan JET Scorecard will contain the name of Candidate, roll number, registration number, marks obtained and rank. To access the merit list, enter the registration number and date of birth, it will appear on the screen. You can take print or can download it. After that qualified candidates will be allowed to fill the option form as per schedule prescribed by University. JET Agriculture 2019 Cut-Off will be published after the declaration of result by the official authority. Cutoff will be available online only so from their applicants can check. Rajasthan JET Cutoff will be the minimum marks required to qualify the JET exam set by the authority of MUPAT, Udaipur. Candidates, who clear the cutoff, will be called for the first round of Counselling. Cutoff marks based on the following factors like total candidates appeared in exam, the performance of aspirants, seat availability, reservation policy etc.